Ript Apparel "Trust The Inspector"
It always seems like the daily t shirt sites save the best designs for the end of the week. I guess they figure it’s closest to payday for most people. 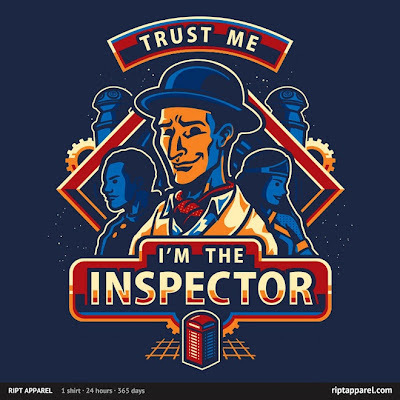 Ript Apparel‘s “Trust the Inspector” by WinterArtwork is perfect for the Community fans who are also into Dr. Who, and vice versa. Available today (08/23) for $10 only (until about 1 a.m. EST tomorrow morning), and don’t forget you can also get it on a hoodie for yourself, or a onesie or kids t shirt for the little ones. UPDATE: As of 08/24, you can find this at WinterArtwork’s RedBubble store.